Why It’s Time To Talk About Women’s Health. Women’s Health primarily revolves around the pelvic floor, a group of muscles that play a large role in core control and everyday function. Your pelvic floor sits between the tailbone and the pubic bone and acts to stabilize your hips and pelvis. The pelvic floor is responsible for controlling core stabilization, urine flow, sexual function, and so much more. Like any other muscle, the pelvic floor can be too tight or too lax, we want these muscles healthy and functioning properly to allow harmony within the body. Why is proper pelvic floor functioning important? 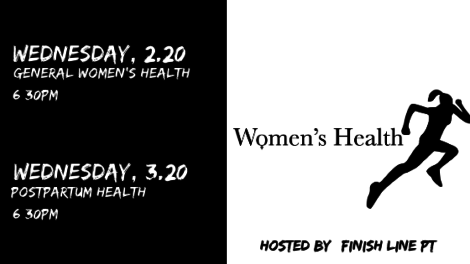 Want to Learn More About Women’s Health? 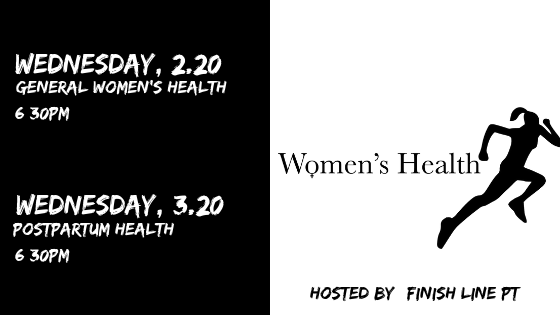 Join Doctors of Physical Therapy Alicia Ferriere and Emmi Aguillard for two events revolving around women’s health. We want to shed light on pelvic floor wellness and ensure your body is working optimally in a way that leaves you feeling healthy and able to perform your daily routines!